Evidence about combining co-production and improvement methodology? Since the last meeting, the group had met to develop and test their ideas. 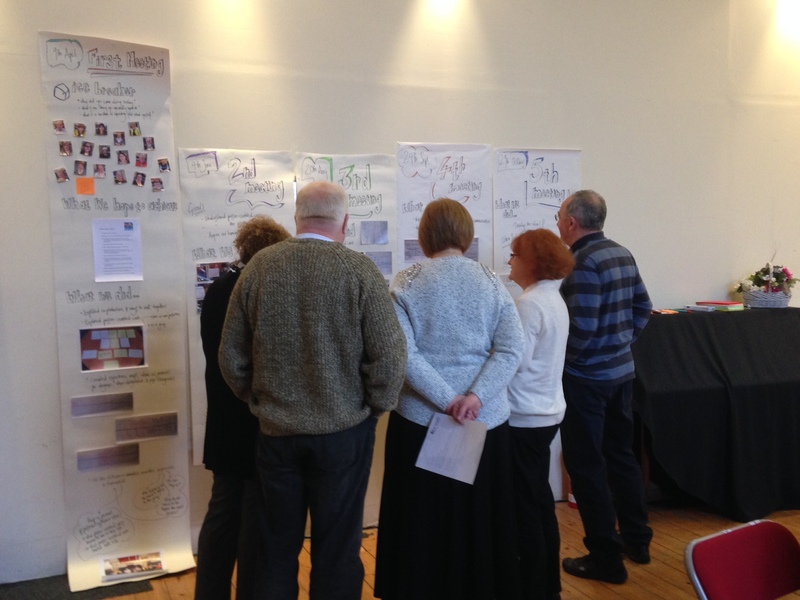 In this session we discussed what people had done and what they planned to do next. As this was the final session, we also spent some time gathering reflections from the group about their experiences of taking part, and celebrating our achievements so far. 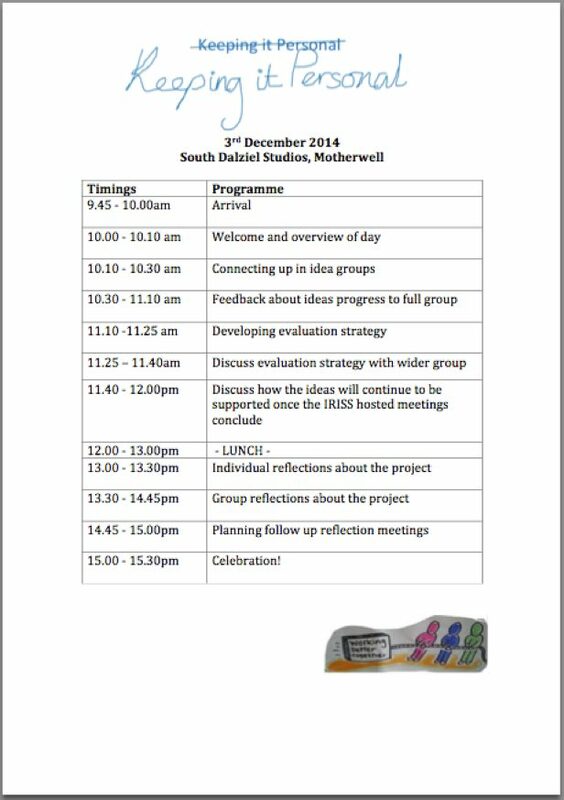 This was our programme for the day. Ten people attended, there was one apology, one person was unwell, and one person was only able to make the end of the session. What is your group’s plan for future? 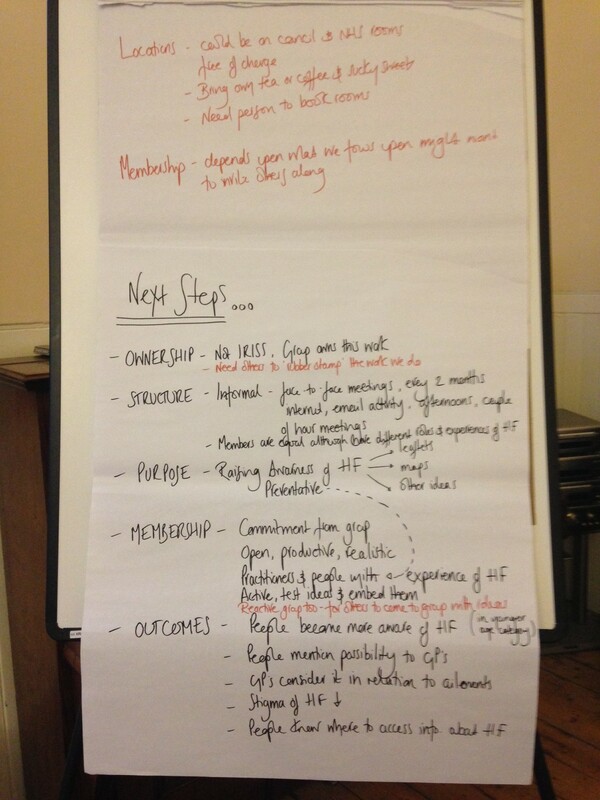 We also gave groups a retrospective evaluation sheet they could use to guide their conversation. Since the last meeting people had met up to take their actions forward and feedback to others. Communication amongst the group had increased and people reported feeling more involved in the development process. Plans from this group involved developing a local campaign to raise awareness, particularly amongst local businesses eg pharmacies, supermarkets, leisure centres. The idea had not progressed due to illness within the group. However, there were plans amongst the group to continue working on this idea along with the ideas from group 4. Group 2 and 3 merged so that information resources could be created, that would support the education and awareness of GPs and also people who may have symptoms, about the early stages of heart failure. As a consequence, everyone in the group was involved in the development of this idea. Activity had involved sharing information about the symptoms of early stage heart failure and about self-management after receiving this diagnosis. A leaflet was produced that could be given to GPs to share with relevant patients. The information was also developed as a powerpoint presentation that could be shown on the TV screens in GP surgeries and used as a screen saver on GPs’ computers. A draft of the information sheet had been sent to local GPs and the response rate for feedback was over 80%. Other ideas from the group were: to include the information they had created on the health information website patient.co.uk; to create a poster that signposts to further information; to continue engagement with the GP practices to further develop the information; and to ask the local authority, NHS and British Heart Foundation to ‘rubber stamp’ this resource. The responsibility for this idea lay with one of the members of the group who was unwell. Therefore there had been no progress since the last meeting. However, a colleague from the local authority had decided to take on the piece of work and liaise with the group regarding its development. Outputs for Group 2 and 3 were the information and resources they had developed. They planned to share information widely through the Living It Up website, making connections with Active Scotland, contributing to the Chest Heart and Stroke newsletter and uploading information on the ALISS website. The outcomes they wanted to achieve were: a greater awareness of the early stages heart failure, a reduction of stigma associated with this condition, people being able to discuss heart failure with their GP when concerned about their health, GPs being more aware of this condition and people knowing where to access information about heart failure. We talked about the difficulties in measuring these outcomes. Challenges included that the chosen outcomes were preventative in nature and would happen across a local area or within a wide heart failure community. 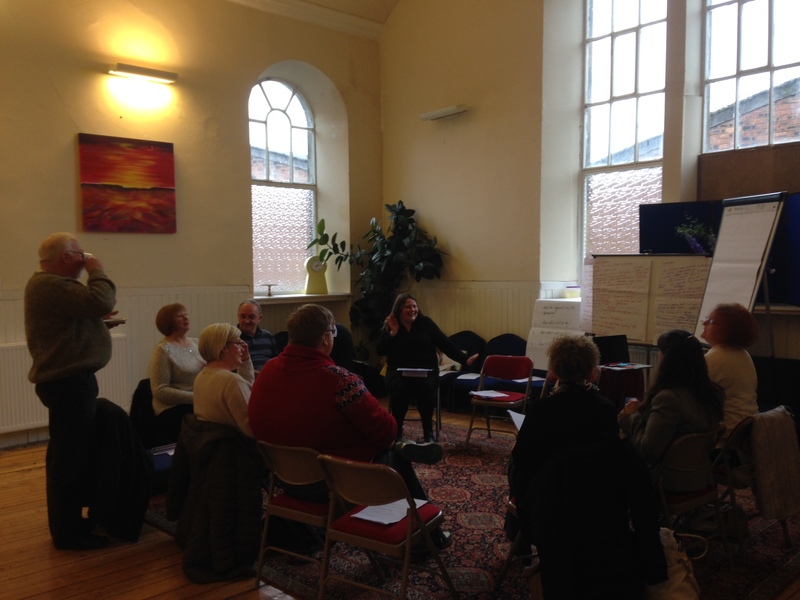 However, the group felt that the direct contact they now had with GP surgeries meant that they would be able to develop more concrete outcomes measures as their information was used. As this was the main idea that was discussed at this meeting this approach was developed by the whole group. 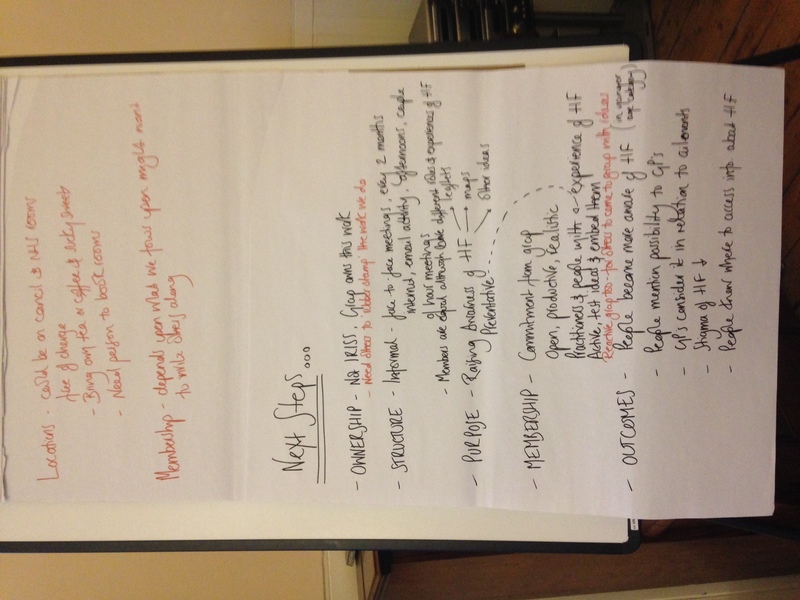 People recognised there were several aspects they needed to be clear about, before discussing next steps. This would enable them to discuss whether they were able to continue to work together, and if so how this would work after this final IRISS hosted meeting. The majority of people in the group said they did want to continue to advance and test the ideas they had developed. They discussed: people’s time/capacity; the membership of the group; the type of meetings they would have and how they would communicate; developing a clear understanding of the purpose of the group; and the group’s focus and anticipated outcomes of their work. The image below summarises this conversation and the decisions the group made. In the afternoon we moved from a focus on idea development, to reflect on people’s experiences of taking part in this project. As the project took place over a year, we started by asking people to reflect on their thoughts throughout the process. 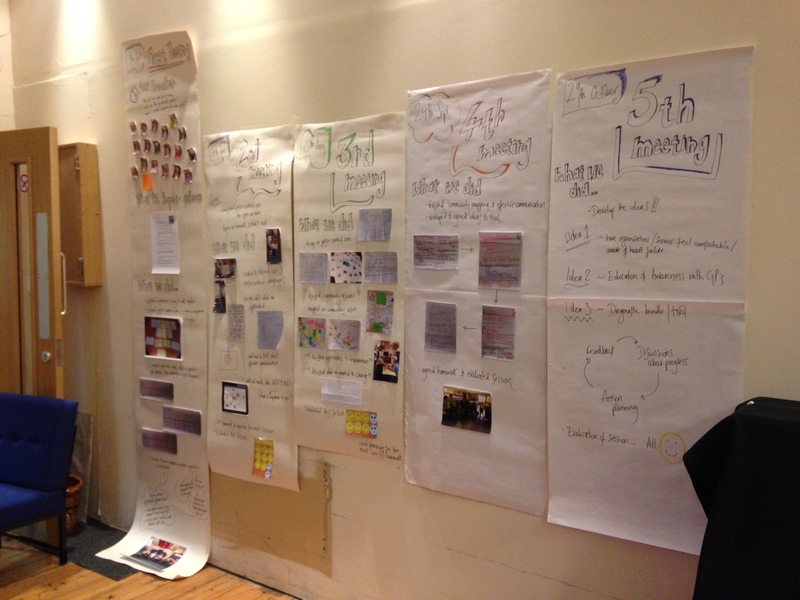 We did this by printing out each of the blog posts which recorded the activity at each session and posted them on the wall so people could review them and recollect their thoughts. What do you think about the work you’ve been involved in? If you were to do this work again what would you do differently? What may you do differently as a result of begin involved in this project? This group reflection offered people the opportunity to share their thoughts with others in the group, to spark ideas and conversations. We recorded what people said and have combined this evidence with people’s individual reflections at follow up meetings to support the evaluation of this work. We concluded this meeting with a party, cake, music and a slideshow of all of the photographs taken during the project to congratulate everyone for all their work. I designed and led this work, and worked in partnership with the Health and Social Care Alliance Scotland on the People Powered Health and Wellbeing Programme. At IRISS I am a member of the Evidence Informed Practice team. As part of my practice I believe we need to optimise the knowledge and expertise by finding new ways to value and share it - or ‘remix it’ to find new solutions. I supported Kerry in the running of this project. 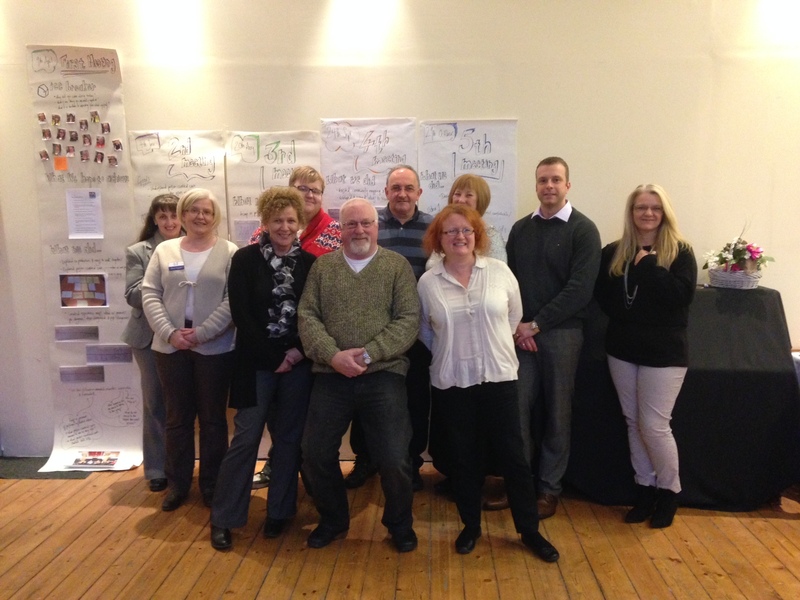 At Iriss I work in the Innovation and Improvement Programme and am a dedicated learner and a proud generalist. I authored the definitions of co-production and improvement methodology and produced the audio content on the 'Approach' page. I managed KiP when Kerry went on maternity leave (Congratulations Kerry! ), and conducted the evaluation of this work with Rikke.